UPDATE: We regret to inform you that Spin Palace Casino is no longer open to Australian players. 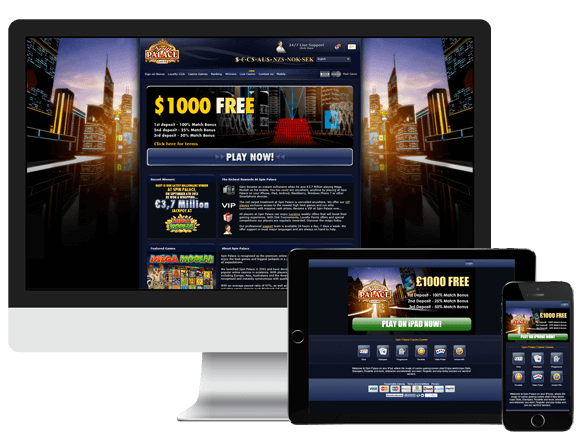 We recommend visiting our real money casino page for a complete listing of Aussie-friendly online casinos with bonuses starting at $1000+ for you to explore. Spin Palace Casino has been around for many years since opening in 2001. 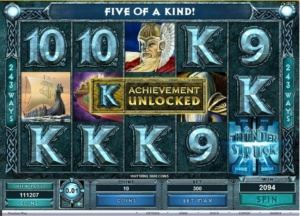 Since then it has become a popular and trusted name in the online casino world, offering players a fantastic selection of online games such as online roulette and very generous welcome bonus. On top of this, Spin Palace prides itself on being as open and transparent as possible, freely publishing its monthly payout audits. This ensures that it continues to build up an excellent relationship with its clients. Powered by the latest Microgaming Software System technology, Spin Palace Casino is regarded as one of the premier international online casinos.With just a few clicks, new users can download Spin Palace’s free casino software, register a Real Account, and make their first secure deposit to get instant access to more than 400 gaming options. Spin Place Casino features a classic design that was painstakingly constructed to replicate the look and feel of a traditional brick-and-mortar casino. And because all Spin Place Casino games are powered by Microgaming Software, users are treated to vibrant graphics and user-friendly transactions that guarantee an exceptionally smooth and enjoyable gaming experience. To reward loyal Aussie players that play for real money, Spin Palace Casino sponsors an exclusive Loyalty Club that is divided into six different Loyalty Tiers. Members are placed into one of these Tiers according to how many Bonus Points they have accrued. Bonus Points are determined by the number of Club Points members earn each month. Club Points can also be redeemed for free Spin Palace credits. Players earn Club Points every time they play an online game. Based on euro denominations, Spin Palace’s Loyalty Club payment system will pay out AU$10 for every 1,000 Club Points. When Australian players redeem their points, they can simultaneously convert the full sum into Australian Dollars. Spin Palace is currently offering an additional promotion to attract new members. Thanks to the company’s new Sign-On Bonus, players who play for real money can receive as much as AU$1,000 free when they register a Real Money Account. And Spin Palace’s First Deposit Bonus allows players to make the most out of their first deposit. The Casino will match this deposit with a 100 percent bonus up to a total of AU$250. Spin Palace Casino employs a friendly, professional support team that is equipped to provide quality customer service 24 hours a day, 7 days a week. These professionals are happy to discuss all aspects of the Spin Palace Casino gaming experience and answer any questions that members might have. They can be reached by email, live chat, or phone at 1-800-76-9359 from anywhere within Australia. Australian players can also make account adjustments and retrieve lost user information by visiting the Spin Palace Casino website. Featuring 128-bit SSL (Secure Socket Layer) Digital Encryption, Spin Palace Online Casino is fully licensed and holds a prestigious Seal of Approval from e-Commerce and Online Gaming Regulation and Assurance (eCOGRA). Spin Palace Online Casino partners with Proc-cyber to protect against all manner of fraudulent transactions. If Australian members are uncomfortable disclosing credit card or banking details through the Internet, Spin Palace will take sensitive financial details by phone over its toll-free customer service line. To maximize convenience for its diverse membership base, Spin Palace Online Casino accommodates a wide range of payment methods, including Paypal Australia, Neteller, Click and Buy, Ukash, and Etropay. The company also accepts direct bank transfers, e-checks, and most major credit and debit cards. Players can place wagers in Australian Dollars. Spin Palace Australia members can choose among a wide array of table games, including poker, blackjack, craps, roulette, and baccarat. Each of these games is available in a range of styles that adhere to a variety of specialized rules. For example, blackjack lovers can play more than 30 different versions of the game, including Spin Palace’s new High Streak Blackjack. The casino also offers online keno and scratch cards. Spin Palace offers Mobile players some amazing sounds and visuals with a wide selection of games available. Players wishing to enjoy Spin Palace on a mobile device simply need to play through their browser, accessing the Instant Play Flash Casino. This will allow you to enjoy your favourite online games through your smartphone, no matter if it’s an iPhone, Android, Windows Phone or Blackberry. As mentioned above, the Spin Palace Flash Casino functions as the mobile casino, allowing players to easily access the casino’s games on the move. 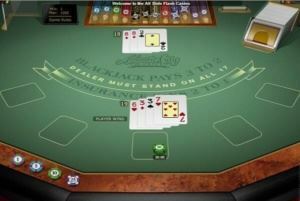 However, players will also be able to enjoy the Instant Play Flash Casino from their home computer or laptop, so there is no need to download Spin Palace’s software if you don’t want to. Players who are interested in trying our Spin Palace will no doubt be wondering if it is a fair and regulated online casino. The good news is that it absolutely is. On top of this it has also been tested and approved by eCogra, meaning that all of the games are randomly and regularly tested to make sure they are fair. Spin Palace Online Casino has really done nothing but impress. Furthermore, Spin Palace Australia is great for all of our Australian readers. Taken as a whole, Spin Palace Casino rates a near perfect score of 4 out of 5. Its classic style and wide variety of games create a truly immersive casino experience. Because it is designed to serve high rollers and low-stakes gamblers alike, I can heartily recommend Spin Palace Casino to virtually everyone.